George Fox Seminary rocked last Friday! I participated in a panel at George Fox Seminary in Portland last Friday. The panel was titled, “Who Am I? Who are you? A Muslim perspective on the role of faith in identity formation,” and consisted of Andy Campbell as the facilitator, Maria Ebrahimji, Muna Idow, Manar Alattar, and myself. We discussed our personal faith journeys, media issues, and women’s issues for an Evangelical Christian audience. I always love to hear how many similarities there are between faiths. I spoke with Loren Kerns, the Director for the Ministry Doctorate Program at George Fox, and we discussed all kinds of similarities between the American Muslim and Christian communities. 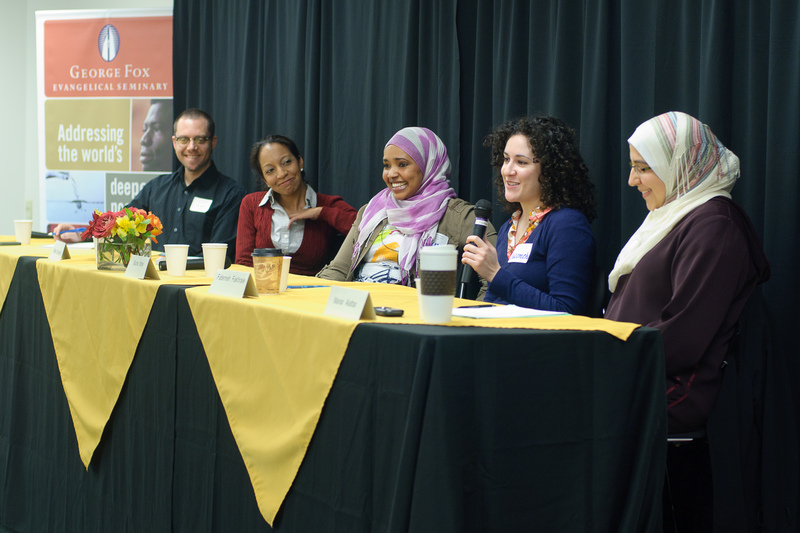 On the panel, from left: Andy Campbell, Maria Ebrahimji, Muna Idow, myself, and Manar Alattar. Photo credit: Loren Kerns. Talking with Evangelical feminists was especially rewarding! I spoke with a few women my age after the panel who shared similar concerns and struggles with faith, feminism, and our place in all of these. It always feels nice to find the people who understand my issues because they have the same ones! I really enjoyed my time at George Fox Seminary and look forward to doing more interfaith work in the future. Thank you to everyone at the seminary who opened their space and their hearts to us! ← I’ll be in the Emirates soon!